Starry sky and large explosive eruption of Colima, photograph by Hernando Rivera. 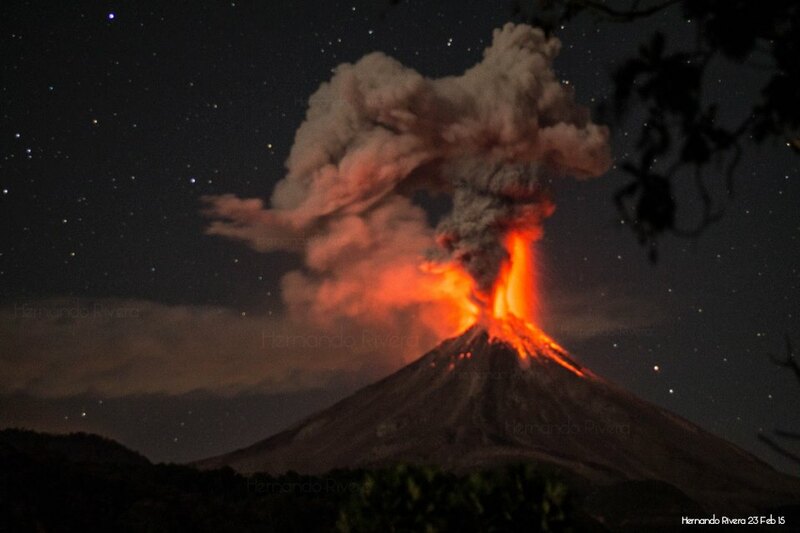 Colima (Western Mexico): Dr Tom Pfeiffer is part of a volcano filming expedition in Mexico at the moment. They have been observing Colima volcano over the past few days. The effusive activity seems to have stopped since there is no more dome building nor lava flows. Explosive activity has taken over instead: Colima erupts in irregular explosions (at intervals of 30mins to 7 hours) of small to moderately large size, emitted from two different vents in summit crater. Ash plumes are rising to max 2-3km and bombs thrown into the air are estimated to travel up to 800m high and land laterally up to 1.5 km away from the vent. Such large eruptions can furthermore last up to 2 minutes.